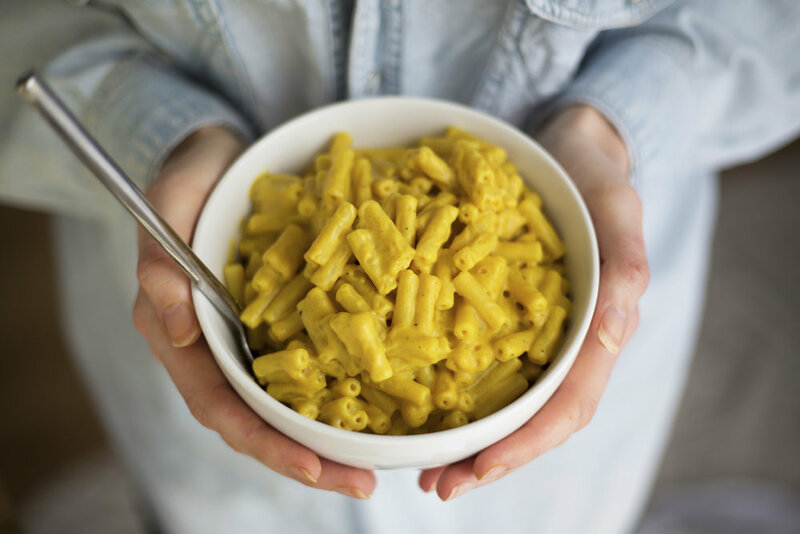 A super quick and very cheesy vegan version of this classic comfort dish. Blend all of the other ingredients together to form a cheese sauce. Taste and adjust seasoning. Once the pasta is cooked, drain and return to the pan. Stir in the cheese sauce with the pasta over a low heat, continuously stirring until the sauce thickens. Serve by itself, or grate over some vegan cheese or enjoy with a side of green vegetables. This recipe is best when fresh and warm, as the sauce will thicken over time (because of the cornstarch). If you have leftovers, stir in a splash of water or plant milk before reheating. I often enjoy this recipe with a side of crunchy green vegetables like broccoli or asparagus. Try baking it! Only cook the cheese sauce for a minute or two in the pan, before it totally thickens up. Add to a baking dish, top with breadcrumbs and vegan cheese, and cook in oven for 10-15 mins until golden and crispy. If you are allergic to nuts, simply swap the cashews for 2 tbsp of tahini.